The Picts are the most enigmatic people of Medieval Europe. Virtually nothing is known of these “barbarians” who occupied the mist-cloaked lands north of Hadrian’s Wall between the Roman invasion and Viking onslaughts. These ancient inhabitants of Scotland’s far north were as mysterious to their contemporaries as they are to modern scholars. They spoke an unknown language, painted and tattooed themselves with elaborate designs, ruled the seas, and even practiced succession along female lines. The Picts left no written records. Almost everything we know of them comes from accounts of their enemies. In 297, Roman writer Eumenius makes the first reference to the inhabitants north of Hadrian’s Wall as the “pictus” or “the painted ones.” The Irish referred to the Picts as “Cruithni” or “people of the designs.” This close parallel to the Roman name suggests that “Pict” was a name the northern Scottish may have called themselves. The Picts were a confederation of tribes that found identity battling a common enemy. Romans tried to conquer them many times but failed. Later, they united against the Vikings. By 900, they disappear from the historical record—apparently merging with Scots culture to the south. Some modern scholars assert that they called themselves “Pecht”—their word for “ancestors.” The terms “Pett” and “Pitt” still figure prominently in place names associated with the Picts. According to A History of the English Church and Its People, Bede noted there were five languages in eighth-century Britain: English, Latin, British, Gaelic, and Pictish. 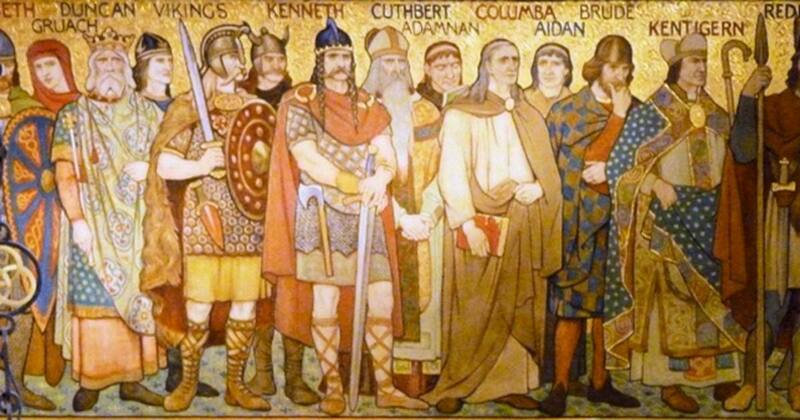 In Life of Columba, Admonan reveals that St. Columba needed a translator among the Picts. Without written records, our only evidence of this mysterious tongue are place names, scattered personal names, and mysterious Pictish rock carvings. Some believe the Picts spoke an indigenous language, possibly a Bronze Age tongue closer to Basque than Celtic. Others believe the Picts spoke a P-Celtic language, which would have been akin to British, which lingers today in Wales. Supporters of this theory point out Pictish place names in northeastern Scotland are clearly indo-European and related to other Celtic tongues. A third theory proposes they spoke a Q-Celtic language brought to their territory by the Irish. The Picts also adopted the ogham alphabet, which originated in Ireland. Written in the 14th century, the Pictish Chronicle lists kings and the length of their reigns. Of the Pictish kings before the late seventh century, fathers are never succeeded by their sons. However, the kings are identified by the names of their male relatives. Critics believe Bede’s tale may have been a ploy to justify Irish kingship of Pictish land. Some, like Celts & The Classical World author David Rankin, believe matrilineal succession may have been a pre-Indo European hold over. Rosemarkie Man’s teeth were shattered, his jaw fractured, and his skull was pierced and crushed. Despite the savageness of the slaying, there is evidence to suggest the man was laid to rest with great care. While his murder may remain unsolved, the arrangement of the burial provides a fascinating window into an enigmatic culture. We cannot know if he was slain in a personal dispute or sacrifice. In 1978, a Scottish farmer unearthed a massive stone slab depicting a man carrying an axe near Rhynie. Dubbed “Rhynie Man,” this 6-foot ornamented stone has mystified archaeologists ever since. Dated to about 700, the boulder depicts a man with a long pointed nose wearing a beard, headdress, and tunic. Rhynie Man was discovered in close proximity to the Craw Stane, another Pictish carved stone depicting a salmon and an unknown animal. Excavations at Rhynie between 2011 and 2012 revealed artifacts suggesting the site revealed Mediterranean pottery, French glass, and Anglo-Saxon metal work. The long-distance trade connections suggest the site may have been a royal location. Archaeologists also discovered evidence of advanced metallurgy at Rhynie. The most common interpretation of Rhynie man is that he depicts Esus—the Celtic god of trees and forestry. The area also has stones bearing the Irish ogham alphabet, and later Celtic cross stones. Since the 19th century, painted Pictish pebbles have been the subject of heated debate. These small quartzite rocks are painted with simple designs. According to local lore, they were “charm stones” or “cold-stones.” As late as 1971, these magical rocks were used to treat illness in both animals and man. An alternative theory proposes the stones were slingshot ammunition and the markings indicated the owner. In 2014, stonemason Robbie Arthur and researcher Jenny Murray sought to replicate the stones. They discovered the stones were painted with a dark substance produced from burning peat. Peat was a common source for domestic and smelting fires in Scotland. The researchers discovered that if left overnight, the pigment would remain on the stone—even after exposure to hot water. Similar painted stones have been found in central France, the Pyrenees, and southern Italy. The continental versions all date between 12,000 and 10,000 years ago. In 2015, archaeologists uncovered an Iron Age fort built by Picts that attests to their prowess as Medieval naval power. Located atop a 20-foot high Dunnicaer sea stack, the fort could only be accessed via climbing ropes up the cliff-face. Dated between the fifth and sixth centuries, this was a likely part of a series of forts monitoring Scotland’s east coast. The massive stones used to build the fort were imported from elsewhere. The exotic rocks contain stylized designs of fish and rings with broken spears through them. Aberdeen University’s Dr. Gordon Noble notes, “The Picts were known as sea raiders and forts like this may have helped cement that naval power.” Nobel and team uncovered the remains of a rampart wall, postholes, and the remains of a hearth still containing charcoal. Nobel suspects the site also held a Pictish settlement constructed of wood and long-since decayed. Virtually nothing is known of the most famous Pictish king, Kenneth MacAlpin. By the mid-ninth century, Vikings had obliterated the Pictish kingship. MacAlpin stepped into this power vacuum. Born around 810 to a Gaelic father, King Alpin II, and a Pictish princess, MacAlpin set out to unite the Pictish and Gaelic kingdoms. He had rivals. Legend say the seven royal houses of the Picts, led by Drust X, opposed MacAlpin. One of the more lurid tales of “MacAlpin’s treason” tells that he dispatched his drunk adversaries with booby-trapped benches, which plunged them into spike-filled pits. That’s unlikely, however. Sometime before 848, MacAlpin united the Picts and Gaels. The Viking threat still loomed. One story tells that 140 Norsemen vessels bore down on the Gaelic Dal Riata kingdom. After the Viking onslaught, the Gaelic Dal Riata kingdom vanishes from history. Following McAlpin’s death in 858, the Picts also disappear. In 2011, archaeologists discovered a mysterious Pictish beast carved into the wall of a farm on Black Isle. Dated between the fifth and seventh centuries, the Pictish beast stone lacks weathering. Researcher Cait McCullagh believes this might mean that it was housed inside or buried before being placed in its current location. Early Medieval sculpture expert Isobel Henderson initially stumbled upon the carving, which contains a crescent, comb, and mirror in addition to the enigmatic animal. At a nearby farmhouse, Henderson discovered a second Pictish carving depicting either fish scales or goose feathers. Given a recent heritage project of the area, McCullagh indicates, “It is a mystery why it’s taken so long for the stones to reach our attention. It is also exciting to think that maybe there are more to be found.” Until 50 years ago, both stones were on property owned by one family. Scholars have long questioned what became of the Picts when they vanish from history around the ninth century. In 2013, DNA analysis proved the Picts are alive and well. Geneticist Jim Wilson identified a Y chromosome marker that arose among direct descendants of “the painted ones.” Of the 1,000 Scottish men tested, 10 percent carry the R1b-S530 marker. Less than 1 percent of English men carry this chromosome. The Picts are also found in Northern Ireland. Three percent of Northern Irish men in the test were R1b-S530 carriers. However, only one participant out of 200 from the Republic of Ireland to the south had this Y chromosome marker. From a political standpoint, the Picts appear to have vanished after a battle with the Vikings at Strathmore in 839 and Kenneth MacAlpin’s unification of the Gaels and the Picts. Genetic analysis tells a different story. The Picts are still with us. Dubbed the “Indiana Jones of ethnomusicology” by TimeOut.com, Geordie McElroy has hunted song for the Smithsonian, Sony Music Group, and private collectors. A leading authority on occult music, he is also singer of LA-based band Blackwater Jukebox.